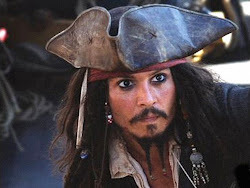 Snippets of Jack: "To Jack Sparrow"
Weary, dirty, and depressed, Will, Elizabeth, Gibbs, and the rest of the crew make their way back to Tia Delma's hut in the final scene of The Pirates of the Caribbean: Dead Man's Chest. Except there's one really important thing missing from this crew: Captain Jack Sparrow and his beloved ship The Black Pearl. Poor Jack, taken by the kraken to Davy Jones' Locker (thanks to a certain someone, but we don't need to point names and name fingers). Poor crew, they're nothing without their good old crazy captain. In Tia Delma's magical shack they commerate they loss. Tia Delma: "Against the cold and the sorrow. It's a shame. I know you're thinking that with the Pearl. you could have captured the devil and set free your father's soul." Will: "Doesn't matter now. The Pearl is gone, along with its captain." Will continues to toss his knife into the wood table. I don't think that is proper table manners when you're staying in someone's house as they serve you nice beverages. Gibbs, being probably the closest and longest friend of the fallen captain, begans a nice speech in honor of Captain Sparrow. What a great first mate. Gibbs: "Aye. And already the world seems a bit less bright. He fooled us all right till the end, but I guess that honest streak finally won out. To Jack Sparrow!" Ragetti: "Never another like Captain Jack." You would know, you helped commit mutiny on him and stranded him on an island with nothing but a gun to shoot himself. Pintel: "He was a gentleman of fortune he was." Except for when you kicked him off his own ship that costed him his soul to get in the first place (which is why everyone is even in the mess). Elizabeth: "He was a good man." Stop bringing up your little inside jokes. Will has nothing to say, because he's still pondering the kiss between Elizabeth and Jack. So he just takes a nice drink. Now what are they to do? They've got no ship to return to their previous lives. Not to mention if they wanted to the Royal Navy probably has a warrant for each one of their arrests. They have no idea where the heart of Davy Jones' is. And they've got no drunk captain to set them on an adventure. It seems as though Davy Jones as won, and there's no hope left. Will doesn't even seem happy that Elizabeth is safe, and that's saying something. Will then looks over at Elizabeth, who is trying to sip her drink but seems more like she's about to throw up. Will, being the good old fiance he is, tries to cheer her up: "If there was anything could be done to bring him back , Elizabeth. . ." Tia Delma: "Would you do it? Hmm? What would you, hmm? What would anay of you be willing to do, hmm? Would you sail to the ends of the Earth and beyond to fetch back witty Jack and him precious Pearl?" Ohhh, I hear a plot forming! Of course, good old Gibbs is the first to speak up :"Aye." Pintel: "Aye." Ragetti: "Aye." Cotton's parrot: "Aye." Even the parrot agrees, that's one committed crew. Then there's Elizabeth, who through her tears still thinks she's too cool to talk pirate, says, "Yes." Will: "Aye." Tia Delma: "All right. But if you go and brave the weird and haunted shores at world's end then you will need a captain who knows those waters." And the plot thickens. Step, step, step. Whose boots are those making giant thuds as he descends done the stair case? It's Captain Jack Sparrow, back from the dead already. APRIL FOOLS! Acutally, it's none other than HECTOR BARBOSSA! Barbossa: "So tell me, what's become of my ship?" The down side is that with this new captain, comes the dumb monkey, Jack. Then Barbossa bites into his nice juicy apple.